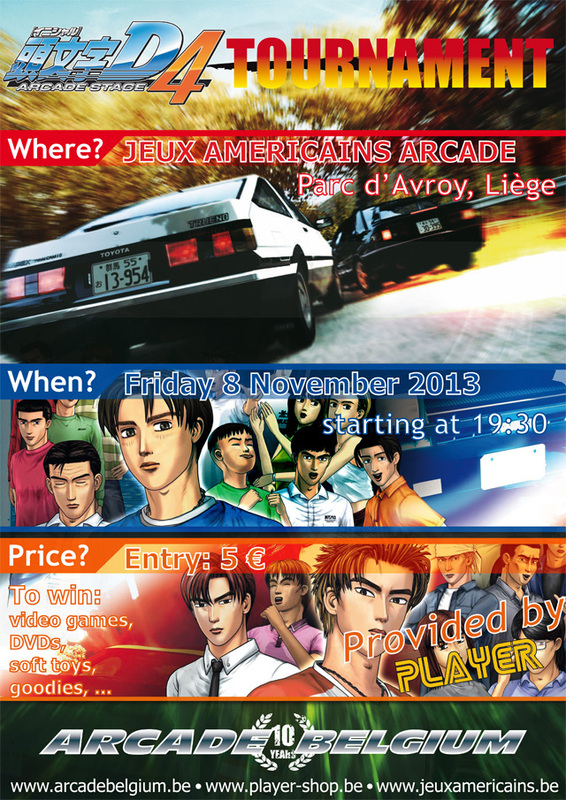 On Friday November 8th, 2013 at 19:30, an Initial D 4 tournament will be organized in Liège, Belgium. It will take place at the Jeux Américains mobile arcade located in Parc d'Avroy (near Liège-Guillemins train station). Prizes: video games, soft toys and goodies. Video games are provided by Player shop, rue de Gaillarmont 71 in Chênée (Liège). Tournament entry fee is 5 €. Tickets will be available at the Jeux Américains cash desk 30 minutes before the event. Tickets will still be available during the first round of the tournament (first round that will last between 40 and 80 minutes) so don't worry if you can't make it to the place for 19:30. Please note that tickets are not refundable, even if you can't enter the tournament. Pairs of players will be draw. Each pair will compete in a race of Initial D 4 arcade game. It will be a single-elimination tournament so the loser will be eliminated. However, if the number of players for the second round is not 8 or 16, "lucky losers" will be draw to re-enter the tournament. Just before the finals, a race will be organized between the losers of the semi-finals for the third place. You can use your own Initial D 4 licence (IC card) at the tournament and you can switch cars between race. That day will also be Arcade Belgium's 10 year anniversary. Where do you get new id4 cards?